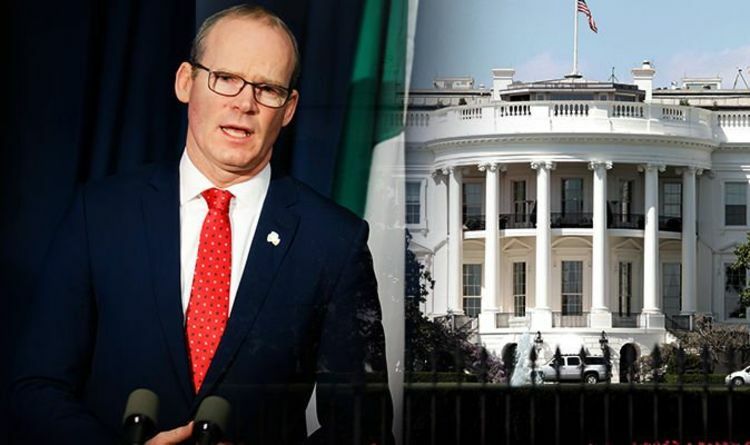 Simon Coveney, who also serves as foreign minister, will make the trip to the US next week to meet with Irish-American lawmakers behind a move to oppose the return of a hard border in Ireland. The planned talks come just days after MPs in Westminster voted to scrap the backstop designed to avoid a hard border and replace it with “alternative arrangements”. On the day of the vote, congressman Brendan Boyle put forward a resolution which, if backed, could see the US Congress formally oppose the reimposition of border checks in Ireland, The Irish Times reports. Speaking after the House of Commons vote, Mr Boyle said the decision by MPs underlined the urgency of the issue. He told the Irish newspaper: “I felt that this was the right time for the US Congress to state publicly what many of us have been saying privately for some time. “The Good Friday Agreement is one of the great foreign policy achievements of the 20th century. It eliminated the hard border that then existed between Northern Ireland the rest of Ireland. The intervention comes as Britain continues to seek free trade deals across the globe in preparation for its departure from the European Union. Earlier this month, International Trade Secretary Liam Fox agreed the UK’s first post-Brexit trade deal in principle. The future deal with Israel can be formally signed once Britain leaves the EU and a trade continuity agreement, which provides preferential trading arrangements, has since been agreed with Chile. Mr Fox had previously claimed that as many as 40 free trade deals, designed to replicate those negotiated by the EU, could be ready by March 29. However The Financial Times last week reported that a leaked internal Whitehall memo warned the UK is unlikely to finish these agreements in time. Brexiteers have insisted that a free trade agreement with the United States - the world’s biggest economy - would be a major boost after Brexit but this latest move in Congress could dent the chances of sealing a deal. And while Donald Trump is eager “to do a quick, very massive bilateral trade deal”, according to the US ambassador to Britain, Theresa May’s deal could scupper chances of such an agreement being signed. In an interview with BBC Radio 4 last month, ambassador Woody Johnson warned the Prime Minister's plan for close ties with the EU after Brexit made it unlikely that a deal could be struck. Mr Johnson said he believed members of Mrs May's cabinet realised the risks to a UK-US deal but acknowledged the British Government had to balance its interests in making a decision. He said: ”I think they do understand but there are trade-offs in the situation they are dealt with and so they are going to have to measure the impact of all the other trade-offs in terms of how important these kinds of new trade arrangements, these new important trade arrangements, would benefit the people in the country."